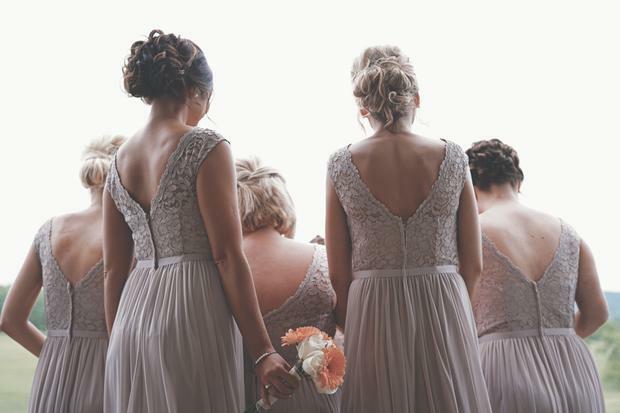 A wedding dress shop owner who offered up to 100 bridesmaids dresses for free to help brides left in the lurch by the closure of Dublin bridal boutique Wedding World, has asked Dublin hotels to help out with her plight. Speaking to Liveline, Bernie O'Farrell from B Couture said that she had been in contact with other bridal stores who could be in a position to offer unworn 'sample' dresses to brides who could be left without bridesmaids dresses ahead of their big days. She said she has received a large amount of interest in her sample stock of Dessy dresses, left over when she cut ties with the company after feeling that she had been consistently undercut by the now defunct Wedding World for the same dresses. "I've asked other stores if they could get their dresses together for one day, so that brides could arrive with something to say they have lost their deposit and we could try to sort them out," she said. The wedding dress shop owner said that together with other stores a 'pop up style store' could be created, taking place in Dublin where brides left devastated by the closure of Wedding World could come to find a suitable dress for their maids. She made a call out to Dublin hotels to offer the space. Meanwhile, bride-to-be Aoife said that she had paid a deposit of €500 to Wedding World in Fairview on the 10th of February for two bridesmaids dresses, and was told the dresses would arrive in 10-12 weeks. "I never heard from them," she said, confirming that suppliers Dessy had received the order for dresses, but not the money, and asked her to pay in full to them for the gowns. "Fair play to Dessy," she said, "but what I do think is wrong is they're asking for €1400. "I just don't see why they're charging that when they've cut out the middle man."